Lately, I’ve been into the color orange and I mean bright vivid orange like a juicy Valencia orange. For a long time I used to avoid orange makeup because I felt it was always the only option for women of color in makeup (or red) and I’m more of a pink and lavender kind of girl myself. I was rebelling against the standard I guess. Then when I bought a townhouse and created this bold color scheme that included apple green and orange I guess orange started to seep into my subconscious and filter into my makeup routine and accessories. Plus, orange is a pretty flattering color with my skin tone. I guess I could only fight it for so long. I like orange more than red for that bright pop of color or accent color with accessories, it’s a bit unexpected but goes so well with green, blue, brown, yellow and even pink! I totally ran out of the house the other day forgetting to grab a wristlet or clutch for my evening plans so at lunch I popped into Filene’s Basement to find an inexpensive alternative. I found this super cute envelope clutch for $12 and I grabbed it. There were tons of color options but this orange was calling my name and I was wearing a dark purple dress and thought this would be a great burst of color to brighten up my look. I’ve paired it with pretty much everything in my wardrobe now and it makes me so happy when I see such a bright and happy color. Perhaps I’m using it to help lift my mood. I’ve also been obsessed with orange lips instead of red lips lately. My favorite combination is a drugstore buy (who doesn’t love inexpensive yet fabulous makeup?). I’ve been wearing Revlon’s new Colorburst Lipstick in Coral and Revlon Super Lustrous Lipgloss in Firecracker, part of their summer color series I recently saw in CVS. If you asked me to describe this bold lip combination I’d say it was orange patent leather, totally glossy and fully concentrated color. I love it. It makes me feel a bit flirty and fun. I own 3 of the Colorburst lipsticks and I have to say I really like the formula. It is definitely long lasting without that tacky feel a lot of the other long lasting lipsticks claim. I also like how rich the color is. My only negatives are that when you first buy it, it smells a bit weird and that I wish it was more moisturizing but it definitely doesn’t dry my lips out like other formulas have. So I’m obsessed with orange right now, what’s your favorite color? DWJ I think we may be fashion soulmates!!! This is my favorite color to wear and accesories with! I have been an orange fan for years and have always loved how it gives you that unexpectant pop of color! I unfortunatly have trouble wearing orange makeup due to my fair/medium skin but MAC has come out with some great spring oranges I’m going to try anyway! Roni you might want to try more in the coral family and not so bright orange for a great lipstick. Fair skin tones look fab in coral! @theaofa I bought the Sally hansen xtreme nail color in orange but hated it against my skin! I’m too pale right now but you should try it! @TheB_Word I’ve still got to get the gorgeous blue polish you picked. I haven’t seen, I think it may be very popular. omg, i love orange, it’s a highly underrated color, and it looks good on almost everyone… thanks for reminding me…it’s one of those things missing from my wardrobe these days! 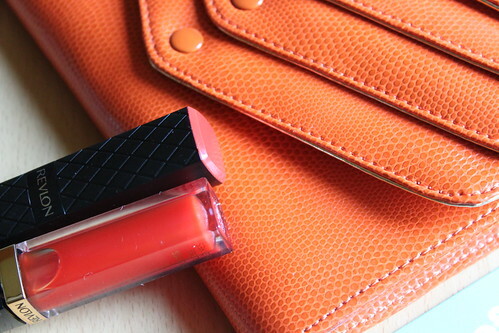 @Jennine orange seems to be slowly seeping into my wardrobe, it makes me smile since it’s such a great color. 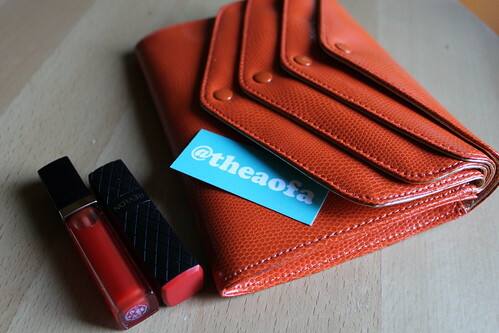 I’m in love with orange, too, and I’ve got my eye on a bright orange purse. How do you use the wristlet? As a purse? An attachment to fit inside a bigger purse? I can never figure it out; mainly because I’m used to large purses and I could easily lose a wristlet! @Chandra I use wristlets mainly when I go out and don’t want to carry a ton of stuff. Otherwise, they’re actually pretty great for keeping stuff together in huge purses. I have BIG bags, so I can easily lose it all.